The cast and audience of ShakesBEER. BOTTOM LINE: Four Shakespeare scenes in four bars, performed by a high-energy company with a lot of talent and no holds barred. New York Shakespeare Exchange is certainly not the first Shakespeare company setting out to “expand the reach of the art form,” and probably aren’t even the first ones to perform this work in bars (that honor, I expect, goes to the original Elizabethans after a few pints), but the ShakesBEER pub crawl does an excellent job of bringing the two together for a fun evening. In this site-specific show, you’ll travel through four bars (don’t worry, drink tickets are included with the ticket price) for a taste of the Bard through beer goggles. This iteration of ShakesBEER takes place in the Stone Street area. 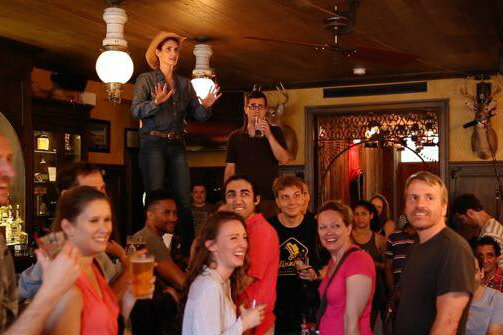 The show tours four pubs in a one-block radius, each with their own vibe, and a scene is performed from a different Shakespeare play at each location. The crawl begins at Philadelphia-themed sports joint Shorty’s with a lively greatest hits of The Comedy of Errors, an early Shakespeare comedy of mistaken identity involving identical twins. The slapstick nature of Comedy of Errors plays well into the pub conceit, with the two Dromios (Devin Haqq and Cory O’Brien-Pniewski) stealing the show, climbing on furniture and setting an early charming tone to the event. Next, at barbecue joint Route 66, the company plays the famous moments of Cymbeline, featuring iPod sound mixing from the bartender and a truly creepy portrayal of Iachimo by Sam Leichter, assisted by Route 66’s ultra-low lighting and vaguely castle-y vibe. Bar #3 rallies the people at Irish pub Beckett’s, featuring a “mash-up” of Julius Caesar and Henry VI, Part II depicting the controversial rise to power of populist Jack Cabe and the intense support of his followers (sound familiar?). Carey Van Driest plays Cabe in a hilarious, long-winded, spirit-stirring and only vaguely political rant—so, like every other evening in an Irish pub. Finally, Bavaria Bier Haus hosts another scene of mistaken identity, this time from Twelfth Night...to be honest, by the fourth drink I lost the nuances of the plot somewhat, but the high energy fun continues throughout the night. The piece is surprisingly not prey to some of the pitfalls of site-specific theatre, as the company seamlessly integrates with the space. It’s especially fun to watch the cast take full control of the pub, climbing on the bar and tables, borrowing drinks and pushing their way through the crowd. The dexterity alone is impressive—I never saw a drink spill once—and the overall effect speaks to the skill of these performers, managing a particularly tricky space and making it look natural. Audience members should expect to stay on their toes: if a performer needs your seat, table, or drink, they won’t be shy about it, and standing near the performance space or moving around the room is often a necessity. I was pleasantly surprised to find these are not your grandmother’s Shakespearean actors, but a young, diverse, high-energy cast of the type you might normally find on a UCB stage. There’s a lot of talent in this company, and the remarkable rapport the group brings to the challenging bar space bodes well for the group’s forthcoming full-length production (sadly, taking place in a normal, only lightly alcohol-filled theatre space). The choice of texts, somewhat unexpected—no done-to-death Hamlet or Romeo and Juliet here—gives the company freedom to play to the subtle human moments that make Shakespeare’s plays so timeless. This is a fun, down-to-earth series of performances, told in an innovative way without being kitschy, and with beer as an added bonus. One can’t help but feel it’s what the Bard would’ve wanted. ShakesBEER is by New York Shakespeare Exchange, text by William Shakespeare. Directed by Ross Williams, Christopher Randolph, Cristina Lundy, and Kim Krane. The cast is Amanda Barron, R.J. Foster, Devin Haqq, Kim Krane, Sam Leichter, Cory O'Brien-Pniewski, Deanna Supplee, and Carey Van Driest.